With the Royal Wedding of Prince William and Kate Middleton taking place this Friday, books about weddings are filling bookshop windows. 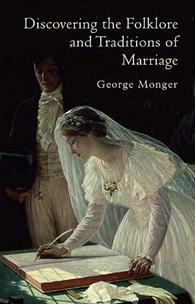 One that took my eye was Discovering the Folklore and Traditions of Marriage by folklorist George Monger. The book is a fascinating look at the customs that have surrounded weddings in the past, some of which are still observed today. It begins with love and courtship - including divinations to find out who one will marry and the kinds of gifts given as tokens of betrothal. Engagement rings only became common in the 19th century, before that all sorts of presents could be exchanged as part of the espousal period, including gloves, shoes, coins, handkerchiefs and even knitting needles or lacemaking bobbins. Preparations for the big day have a huge amount of superstition attached, including picking the right day and the right month. It might be a good thing that Will and Kate are marrying after Easter but at the end of April, because an old saying goes, "Marry in Lent, you'll live to repent" and "Marry in May, you'll rue the day". The big day itself has taken on many forms in the past. Publisher Shire says on its website: "In Britain today the celebration of a marriage in the ‘traditional’ manner is a mixture of something old, something new and something borrowed from other traditions. It is bound up with church and secular legislation, and with custom and superstition. Discovering the Folklore and Traditions of Marriage looks at the ways that marriages are celebrated in multicultural Britain and how the practices of the past are observed, and sometimes altered, for contemporary times." One of the forms of marriage George Monger looks at is the Besom Wedding, in which the bride and groom jump over a besom broom - a besom being the traditional witch's broom made of twigs bound to the end of a stick. Jumping over a broom seems to have formed at least part of the wedding ceremony in many different parts of the country in different forms. In some villages a Besom Wedding was regarded as an unofficial trial marriage - sometimes lasting a year and a day. In Romany culture, however, the couple would hold hands and jump over a besom in front of witnesses as part of a binding and permanent marriage. However, I was a bit disappointed that Discovering the Folklore and Traditions of Marriage doesn't mention handfasting ceremonies - pagan weddings which usually also include the couple jumping over the besom broom. In Scotland, handfastings are allowed as part of a wedding ceremony and they have also been made legal in Ireland. Pagans believe that jumping over a besom symbolises a new start in life as well as the first hurdle the couple must face together. But this is a small omission in an otherwise excellent book. George Monger continues with a look at celebrations following the wedding ceremony, the honeymoon and life after the wedding day. I wonder if Will and Kate will attempt to claim the Dunmow Flitch - a side of bacon awarded to any couple who have been married for a year and a day, who can honestly say they have had no arguments or regrets.